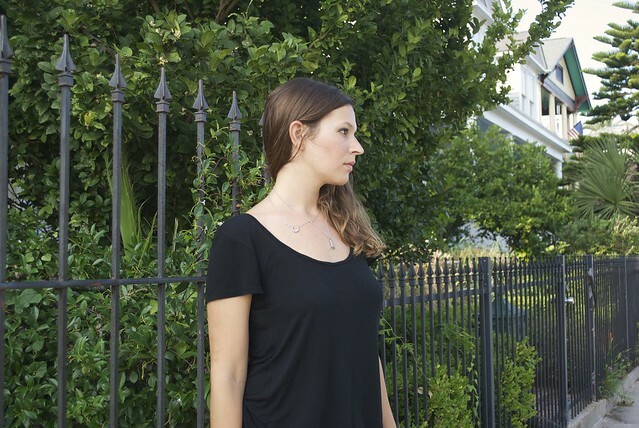 So this month, I bring you the ever-so-humble jeans and a t-shirt combo – in all black. Because black is always the new black. This is my fourth pair of handmade jeans, and I swear they just keep getting better! For this pair I used a black, medium weight denim with a bit of stretch by Theory from Mood Fabrics online. Unfortunately, this fabric is sold out, but you can check out all of Mood’s denims here. I always like to order swatches of my denim before buying, because it’s a bit hard to tell the difference online. That way I can pick out the weight, color, and amount of stretch I like best. This denim had some stretch for comfort, but wasn’t so stretchy that it didn’t feel like denim, if you know what I mean. True confessions: I’ve actually been wearing these jeans for the past three days by the time I got around to photographing them, and the denim hasn’t stretched out much at all! As you can see, I had a good bit of fun distressing my denim! Now, perhaps you are wondering why I would essentially destroy perfectly good, brand new denim? Well, quite simply, I was curious! One of the reasons I love to sew is to try things out, learn new techniques, and make my clothes, truly, one of a kind. Distressing denim is just a fun embellishment! For my pair I used a hammer and a metal plate to hammer each seam, then I took a dremmel tool to the edges to wear them down and fray certain areas. It’s great stress relief! You know, in case the yoga and meditation ain’t working – there’s nothing quite like destroying something to cure what ails ‘ya! For the pattern I used a heavily altered Built By Wendy pants pattern that came with her book, SewU. I’ve used this pattern for every iteration of my jeans so far – it’s a TNT pattern for me. On my last pair of jeans that I made I had some issues with the dreaded leg twist (that spoiler of all jeans-making fun!) If you’re not familiar, leg twist is when one or both legs … well… twist! It’s mildly irritating both visually, and physically for the wearer. 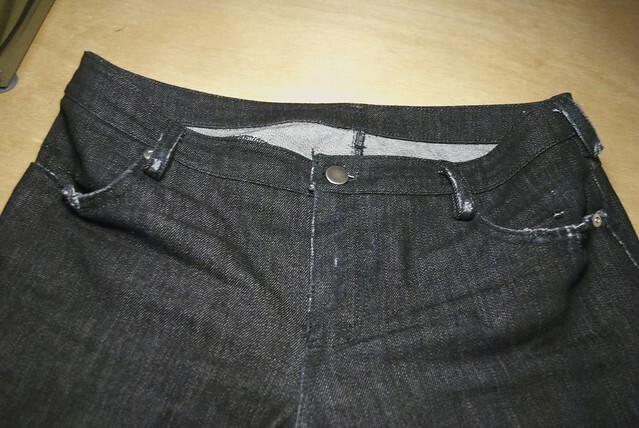 It’s often the result of inaccurate cutting or sewing, and seems to be very prevalent with jeans due to the twill weave of the fabric – which tends to have built in warp (according to my google searches). So this time I took a few precautionary steps to prevent this: 1) I traced and cut all pieces on a single layer instead of folded in half (this also results in greater fabric yield) and 2) I made sure that all the leg pieces were cut from the same area of fabric – meaning I lined them all up, going in the same direction, horizontally across the fabric. This way if the twill weave was to warp, they would all warp together! Anyway, it worked! Nothing but perfectly straight seams here! All of my topstitching was done in black topstitching thread, which unfortunately means that it’s not super visible. This is a shame, because this just might be my best topstitching on a pair of jeans yet! 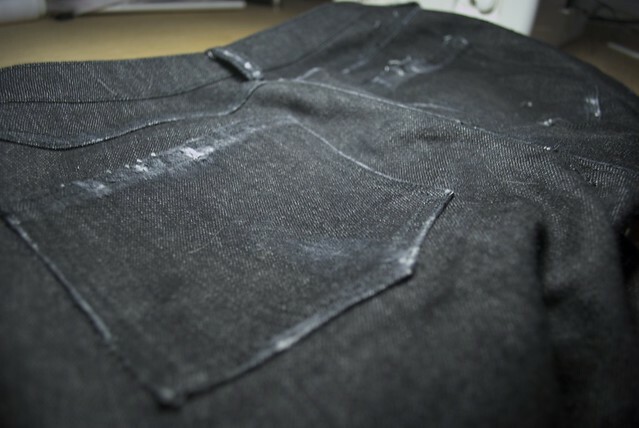 I serged all the raw edges since this is stretch denim, and because I was too lazy to do flat felled seams. 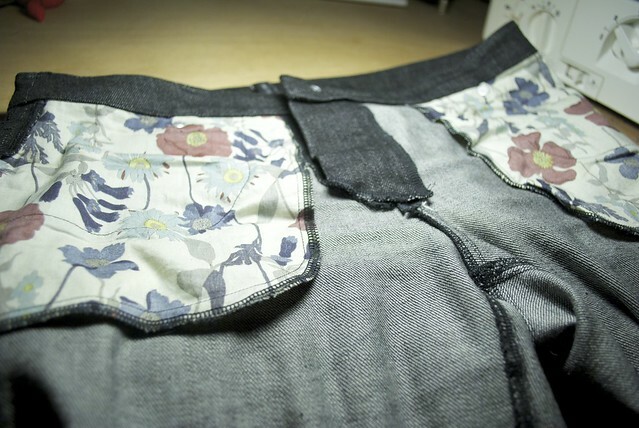 And the pocket lining is just some pretty floral fabric that I keep around for just such a purpose. 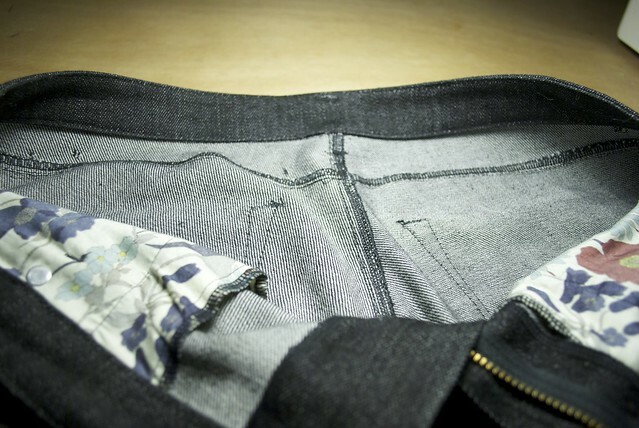 Because jeans sewing can be such a time-consuming project (especially if you’re like me and only own one sewing machine – you’re constantly changing out thread!) I wanted to pair it with an instant-gratification sew. And nothing says ‘instant-gratification’ to me quite like a knit t-shirt! For my t-shirt I used this tissue weight black silk viscose from Mood Fabrics online, and, oh man, is this some luxurious stuff! Lightweight and drapey, with a smooth, silky hand. My kind of t-shirt material! The pattern is the free Plantain Tee from Deer & Doe. I love a free pattern! Even though this pattern calls for a more stable knit, I felt like the drapey quality of this silk viscose would actually pair well with the subtle flared shape of the Plantain tee. I stabilized the shoulder seams with a bit of clear elastic, and sewed all major seams on my serger. The sleeve and shirt hems were both simply folded under and finished with a double needle. I’ve been wearing both of these makes a ton since they came hot off of the sewing machine! I think that’s a sign of a great basic! What about you guys – got any wardrobe basics planned for the near future?